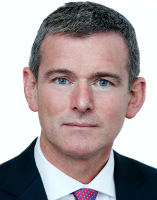 Kieran Corr is the Head of Aviation Finance at Standard Chartered and Chief Executive Officer of Pembroke Group Limited, a wholly owned subsidiary of Standard Chartered PLC. Pembroke Capital Limited was founded in 1993 and provides aircraft leasing, financing, management and advisory services to the aviation industry. Prior to joining Pembroke, Kieran trained as a Chartered Accountant with KPMG and subsequently held various leasing and risk management positions in GPA Group plc and GE Capital Aviation Services. In addition, Kieran worked for GPA Technologies, the division of GPA Group which focussed on investments in aircraft related companies including entities involved in airframe maintenance, engine component repair, engine leasing and aircraft refurbishment. Joining the aerospace sector in 1990, Kieran has over twenty six years aviation industry experience. Kieran joined Pembroke Capital Limited in mid 1995. Acquired by Standard Chartered in 2007, Pembroke owns and manages a diverse portfolio of over 120 aircraft leased to airlines worldwide. Kieran holds a Bachelor of Civil Law degree from the National University of Ireland and is a Fellow of the Institute of Chartered Accountants in Ireland.